This full-featured cat is ready to pounce. 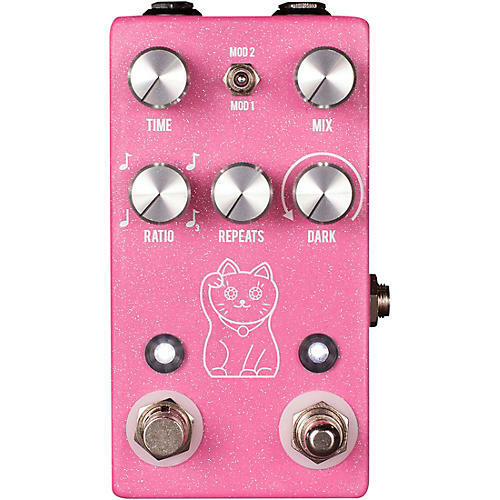 The JHS Pedals Lucky Cat Delay has basic controls consisting of Time, Mix, Ratio, Repeats, Darken (EQ), and a Modulation toggle. Time is a manual control for the length of the repeats up to 1000ms. Mix controls the volume of the repeats, from fully clean signal to fully wet. Ratio controls the subdivision of the tap tempo with options of quarter note, dotted eighth note, eighth note, and triplets. Repeats controls the amount of repeats you will hear, from one repeat to infinite. The Lucky Cat will not do analog delay oscillation, but will do a musical digital oscillation when the repeats are maxed out and you play with the Time control. The Darken control works as an EQ for the repeats only. When fully clockwise the tone of the delay is the fully digital, unaffected sound. As you turn counter-clockwise, the delay will darken in tone giving you an array of delay tones at your fingertips. The Modulation toggle has two modulation settings, Mod 1 and Mod 2, with the center setting disengaging the modulation. Mod 1 is a subtle modulation that gives the delay just the right amount of movement without being overwhelming. Mod 2 is a deeper modulation that gives you a seasick sound for those parts you want drenched in modulation.